Buffets provide diners with some of the widest selections of food they could possibly find in one sitting and for a relatively great deal. But is the food just as satisfying? Food scientists from Cornell University’s Food & Brand Lab analyzed how people felt after dining at All-You-Can-Eat (AYCE) buffets. Their study, published in the journal BioMedCentral Nutrition, revealed if people overate, felt physical discomfort, or guilt after eating to their hearts content for a flat fee. Researchers observed consumers in real-life situations where their natural behavior could be recorded without their knowledge. At Aiello’s Italian Restaurant, an AYCE buffet located in upstate New York, researchers approached a total of 139 participants. Half of the participants were given a flier that promoted an $8 buffet and a free beverage, the second group was given a flier that gave them a 50 percent discount. Over the course of two weeks, researchers observed diners during lunch time from 11a.m. to 1:30p.m. It turns out, the better the deal, the less tasty the food seemed to participants, and it all came down to guilt. "If you don't want to experience guilt or feel stuffed after a meal, eat from a higher priced AYCE buffet and focus on eating more healthy options instead of trying to 'eat your money's worth,'" said the study’s co-author Brian Wansink, director of the Food & Brand Lab at Cornell, in a press release. Wansink and his team studied the magnetic power of buffets before. In his book, Slim By Design, researchers wrote about the time they sat in dark corners of Chinese buffets across the country and observed diners as they chose and chewed their food, sat, conversed, and eve blinked. Slim diners cherry-picked foods and ate their favorites, chose smaller plates, chewed each bite more, and tended to sit in the back in faraway booths along the walls, while heavier diners did the opposite. Instead they chose food that sat next to the closest stack of plates, and filled them up one after another, and sat an average 16 feet closer to the buffet. Their conclusion? Slim people tend to gravitate toward healthier and seemingly automatic habits that helps trick them into eating less. But being slim or heavy didn’t matter when it came to the price tag, the cheaper the deal, the more they ate and regret they felt, and overall the less satisfied they were with themselves. Source: Wansink B and Sigirci O. 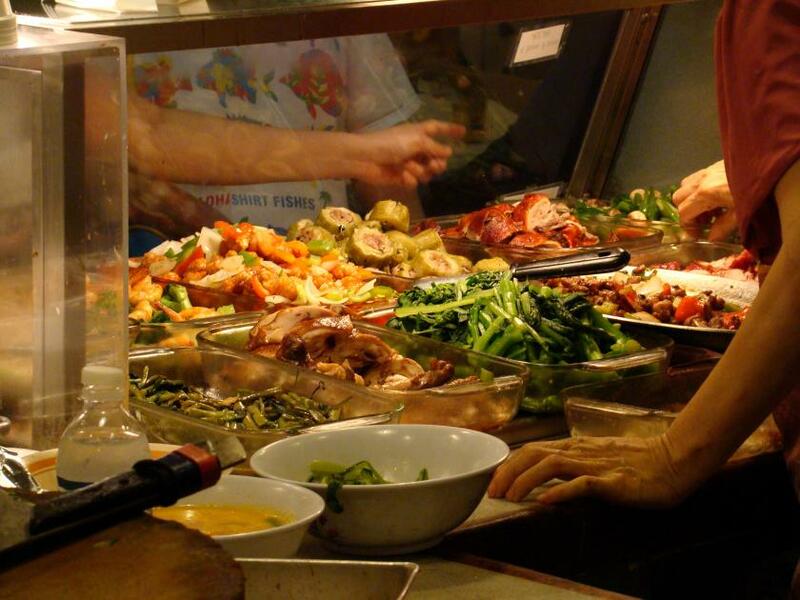 Low prices and high regret: how pricing influences regret at all-you-can-eat buffets. BMC Nutrition. 2015.